We bring the latest video games and most exciting gaming environment right to your door to make your party or event. a winner every time! Play the most popular games with your family, friends or coworkers in climate-controlled comfort. GameStar Mobile offers the latest in Xbox 360 and Wii games like: Halo Reach, Call of Duty:MW3, Guitar Hero, Madden 12, Super Mario Bros, NBA 2K12 and more! GameStar Mobile was designed by a gamer for gamers. It’s packed with state-of-the-art electronics, a killer lighting and sound system and multiple flat screen HDTV’s that virtually immerse you in the ultimate gaming experience. No other mobile game truck in America offers the combination of today’s latest games and Indianapolis’ best smoked brisket in a totally immersive environment like we do. Check out the competition first and then book with us for the same price you get a complete mobile gaming experience like no other! Custom designed by owner Cantrell Johnson, our mobile gaming vehicle goes above and beyond what others in the industry have tried to do. We can comfortably accommodate up to 20 children or 16 adults at a time, more if we set up a rotation schedule. Choosing top quality components to put inside was on our mind from the start, every aspect of the gaming vehicle was engineered to make your time with us and experience you’ll soon not forget. At GameStar Mobile, everyone is a winner!!! 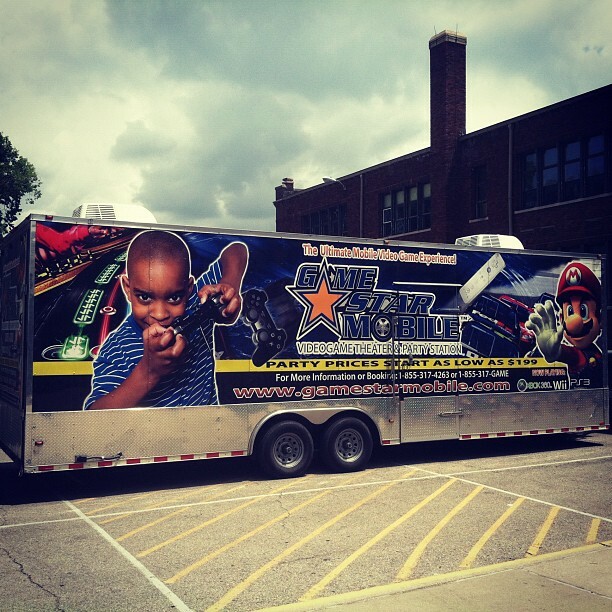 Our standard mobile video game theater can accommodate up to 16 gamers playing at a time where our new mega trailer can accommodate 20 children at a time.